Across decades, lineups and albums, few guitarists are as immediately recognizable by their tone as Smashing Pumpkins’ Billy Corgan, despite his constant experimentation and churning inventory of sonic hardware. Corgan’s “jet aircraft tone” and attention to production detail have stood in stark contrast to the prevailing sound of grunge in the ‘90s, the heavy metal of the ‘00s and the Auto-Tuned pop of the ‘10s, all while inspiring legions of disaffected flannel-clad slackers, teen goths, mainstream rock radio listeners and digital natives alike to crank up the gain and, despite all their rage, wail away on a Stratocaster. 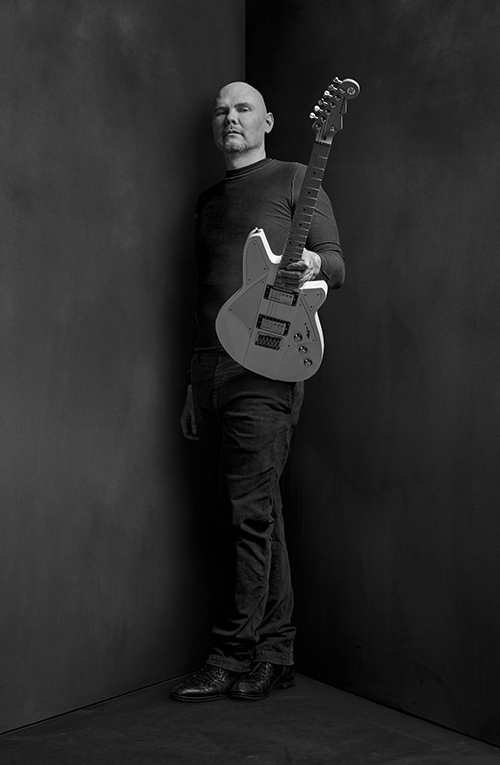 With this week’s introduction of the Reverend Billy Corgan Signature BC-1 Electric Guitar, designed with and built by Joe Naylor and the team at Reverend Guitars, Corgan says he’s newly inspired to create guitar music and burst through the narrow confines of Pro Tools-enforced conformity. Corgan and Naylor sat with Reverb to discuss his long-term relationship with Reverend, the history of their collaborations and, of course, the BC-1, which was designed to visually and sonically carry Corgan, Smashing Pumpkins and his other projects through and beyond his audience’s expectations. How did your relationship with Reverend get started? Joe: It was around 2000. Billy was looking for something with a long scale for down tuning. At the time, there weren't a lot of baritones. He had this concept to make a longer neck, so it would hold the tuning better. We did a 26-1/4 inch Reverend and tuned it in drop C.
Billy: Yeah, I used it for TheFutureEmbrace and that tour. I did a lot of recording with it, and you built me some other custom guitars for that tour. I still have those, which are beautiful. So that began this relationship, which we circled back to a decade later. One thing about Reverend is the build quality, but the relationship is superior to any company I've ever dealt with. I understand Billy was integral to the design and creation process. Can you talk a little bit about that? Billy: I was so frustrated that there hasn't been any innovation in the guitar world for a long time. Everything we talked about was an effort to move the ball forward. In the Smashing Pumpkins, the dynamic range of the material is so wide that it's often hard to play a concert with just one guitar. So I was looking for a design that encompasses all of that dynamic range. 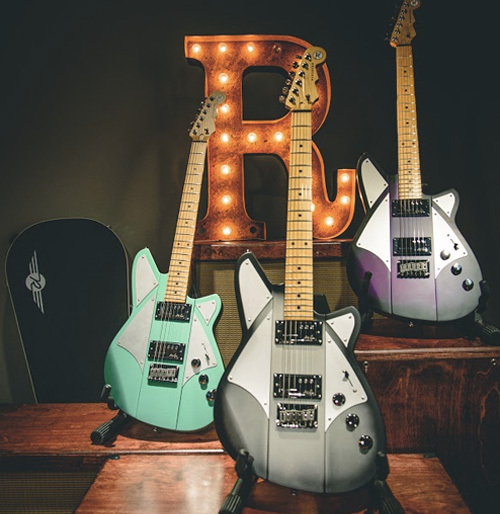 What ideas and design elements were you looking to incorporate in the guitar? Billy: This guitar has everything I've had on my guitars for years: graphite nut, hardtail bridge and back piece, everything that has to do with getting that initial attack. But we’ve taken it a step further so that I have a wider range of tonal and creative variation within the instrument. The first thing that I said was: If it doesn't have enough gain, it won't matter how nice it is. I need to be able to get that jet aircraft sound. But it also has to have articulation. In the Pro Tools world, the amount of mid-range that's going out has changed the way people record guitars and the position of guitars in the recording field. In essence, it's kind gotten more fizzy and narrow. I went with single coils in the early days of the Pumpkins, but with the scoop of the flat-pole pickups. Then I went to the Lace Sensors, which gave me more gain, but I didn't like the articulation, particularly when the guitar was clean. Then I went to P90s, just to do something different. But the lack of gain drove me insane, and there were noise issues. That's probably when Joe and I first met. I was trying to take the P90 thing into a different place, which he did. Joe: He wanted to see where we could take this. That was a big part of the challenge, especially with the pickups. I knew it had to do Billy’s thing, and then it also had to be versatile. How do we get both of those worlds in one instrument and keep it simple? There's a certain beauty to simplicity. Billy: As a touring musician, you go into a variety of venues and deal with a variety of issues. So you have to have an instrument that's responsive to the environment. If it only sounds good in a padded room, and it doesn't sound good on some crappy stage with a wooden floor, that’s a problem. Your guitar has to be able to cut through the noise, wherever you are. Great instruments have a way of distinctively putting their voice through whatever situation you're in, which is why I would go back to the same guitars over and over again. Joe, can you tell us what the Railhammer Humcutters are, and how you created them? Joe: The Railhammer Humcutter design started previous to this project. I was trying to get the P90 sound without the hum. It has two full-size coils, like a traditional humbucker, but we removed half of the pole pieces on this side, and half on the other, so it senses the strings like a single coil would. But because you have two coils, it cancels the hum. It's as quiet as a humbucker, but it has the articulation, punch and narrower mid-range frequency that you find in a P90. And that allows it to cut through a band really well. We went through five prototypes to achieve “the Sabbath note,” which has a lower mid-range fatness to it. Billy: The key word is articulation. If you're playing a fat chord or some low run, those notes are big enough that it sort of sounds orchestral, maybe cello-like, like what I'd heard in those earlier Black Sabbath records, which has been much emulated but rarely imitated. Joe: When I did this bridge pickup, I wound this a little hotter than a P90, and that's how you get that fatness. That's how you get the “Sabbath note” that’s present in this bridge pickup. But the neck pickup is a little different: a little cleaner, bordering on Strat-y, although you primarily use the bridge pickup. Billy: This goes back to the modern application thing. Pro Tools recording has narrowed the sound of the guitar to basically three guitar sounds. Unfortunately, the sound of a rhythm guitar in the neck position is something you're not going to hear much outside of roots music or a Grateful Dead type of jam band. If I'm using the neck pickup, I'm probably using it for soloing and textural switching. It has so much to do with the brightness in modern recordings. Those murkier, muddier tones, which are really beautiful, don't tend to work in those applications anymore. 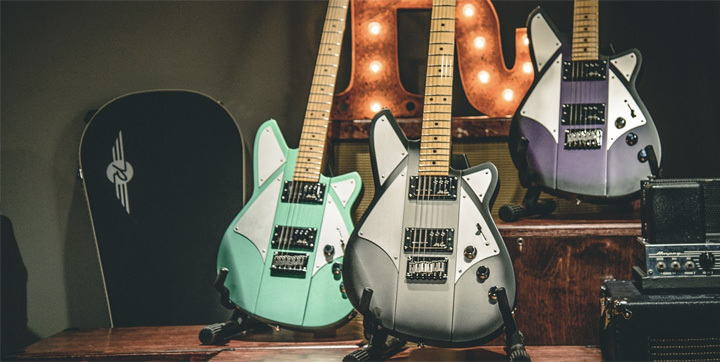 Early prototypes of the guitar had three pickups, but the production model has only two. How did you make that decision? Billy: My right-hand attack is so intense that I'd literally break my finger on middle pickup. Also, I didn't find the middle pickup did that much for me. I just couldn't find uses for it and it wasn’t ergonomic, so we put the focus on the front and the back pickups. Joe: It ended up sounding better with just the two. Sometimes when you have three pickups, you have to make compromises in the tone for those in-between positions. Once we figured out that Billy was not using those two and four positions, it made a lot of sense just to yank it out. What do you think about the design aesthetic and how it feels? Billy: What most intrigues me about the instrument is that there's a hollow thing going on; it gives the instrument just a little bit more tonal distinction. Joe: He’s talking about the chambers. They make it lighter and better balanced. When you remove wood, it creates a more flexible instrument. When an instrument is more flexible, it can resonate more. You can hear how well this thing rings, even unplugged. Then you hear some of that resonance, a little more harmonic content, a little more character, coming through the amp. It all adds up to a more lively sound. Then we machined the wings on the body, so you have a raised center section. The wings are a little thinner than the rest of the guitar, so they resonate a little bit, but the mass in the middle maintains the sustain. The neck heel also is contoured, so you have better access when you're shredding up here. Is it going to help you tour with fewer guitars? Billy: Can it apply in all sorts of situations? Yes. But at some point, an instrument has to have a specificity. It has to have a voice and you, as an artist, must work within that voice. That voice should inspire you. So there's something about this voicing I really like: The combination of the classic Smashing Pumpkins low sound -- that slurry sound that I have always been attracted to -- and the ability to have a lot of articulation in the mid-range up to the high notes for soloing. It makes me want to make new guitar music, using this instrument as the featured voice. 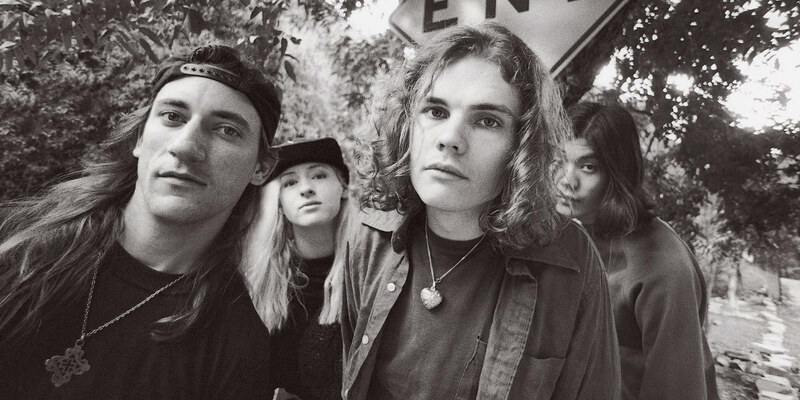 Few bands are as immediately sonically identifiable as Smashing Pumpkins. Here's a look at the gear they used to create the psychedelic heavy-metal sound that has defined the band through its many incarnations. Reverend is well known for the bass contour, do you use that feature? Billy: What sort of shocks me about this guitar is that, when it's full-throated, you get this mass of sound. But when you roll it back, you get more kind of a classic, single coil attack. I'm not saying you're going to play surf, but you can do stuff with that classic, clean '60s to early '70s type of attack without a ton of manipulation involving pickups or volume. It's like downshifting a car into a different gear. I think that combination, with the pickup set and the hollow cavities, gives it a distinctive tonal quality, I think that combination is really progressive. I'm intrigued to learn how to use that and take advantage of it, particularly in a concert setting. Joe: Our bass contour is on most every Reverend guitar. As you back it off, it starts to cut a specific frequency. You start to thin out the sound. It lowers the gain a little bit, and it starts to go into that twangy sort of Fender-y sound. It lets you do a lot of things with a simple layout. I'm not a big fan of complicated guitars. Three nobs is plenty, maybe four. Billy: I agree. Most of the successful instruments that I've used in my musical life have been very, very simple. They work out of the box. You plug it in and go: Yeah! That's what I want!